I've been wanting to see this film since I heard it was smuggled out of Iran in a cake, and boy did it not disappoint. This is a vital film, probably the most important of my lifetime. One of my favorite Internet writers, Sheila O'Malley (who also ran a fantastic Iranian film blogathon last year to which I contributed), compared This Is Not a Film to Oscar Wilde's De Profundis. I honestly can't think of a better summary. Panahi's filmed limbo is wrenching and outrageous, and his sadness comes not from his fear of prison but the idea of not being able to make art anymore. But even as he despairs of this, he makes what may be his greatest artistic statement yet. Along with Film Socialisme, no other film so optimistically looks at the possibilities of the modern era for filmmaking, and for protest. The Iranian government can firewall the Internet to prevent communication on Twitter, but people will find ways around those blocks. 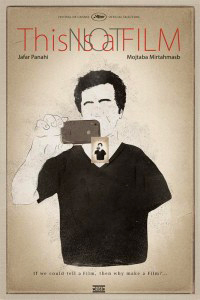 They can take away Panahi's camera, but he still has his iPhone. As infuriating as the injustice behind This Is Not a Film is, rarely have I seen a film so inspiring. Beautifully done, Jake. I love to hear what you got from it. That kid in the elevator ... a natural. So unselfconscious, so funny - I love how he kind of nervously adjusts his shirt as the filming begins, wanting to look nice for the camera. I have worried about that kid since Panahi's detainment. I hope he did not experience any retaliation for just appearing in the film. I am not sure how to find out about that. But he has come into my mind from time to time. Thanks Sheila. Yeah, I hope nothing's befallen that boy either. He's so memorable, so sweet and human. I get so uncomfortable with all this saber-rattling talk of punishing Iran when I think of people like him being caught up in any fighting. What's so great about Panahi is that his films, be they scripted or this, can be explicitly political while perhaps making the most political statement of all in the normal behavior of his subjects. To see this kid wistfully talking about his life plans and his jobs to make those plans a reality...it's impossible not to love him. What a film. Great on so many levels, yet small and humble like so much Iranian film.